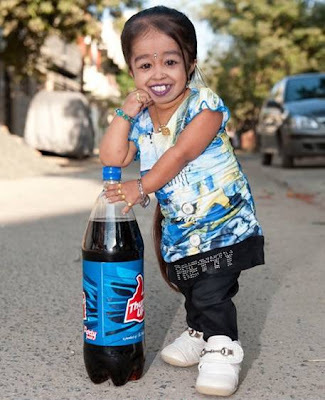 The world's shortest woman - Jyoti Amge, 18 years old and just 2 feet tall. 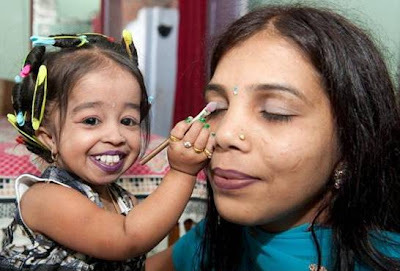 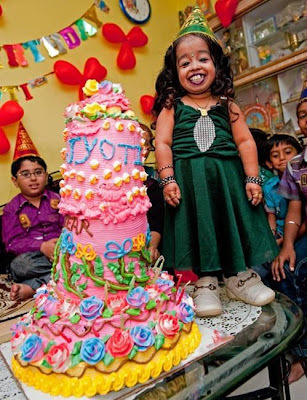 An Indian woman is celebrating her 18th birthday by winning the title of world's shortest woman. 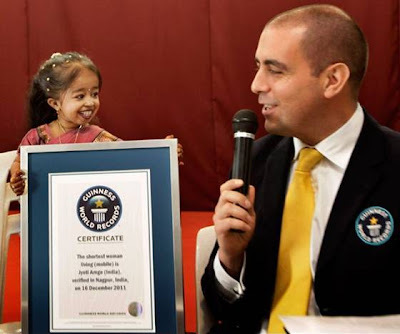 Guinness World Records representatives measured Jyoti Amge at 24.7 inches (62.8 centimeters) tall, making her 2.76 inches (seven centimeters) shorter than Bridgette Jordan, the 22-year-old American who had held the title since September. 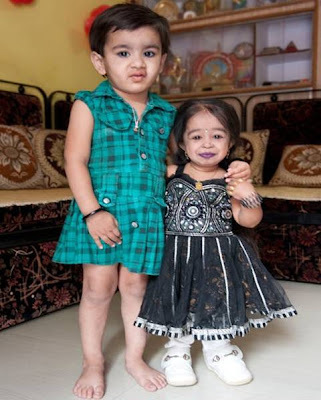 She is shorter than the average two-year-old. Guinness representatives visiting from London measured her at a ceremony attended by family and friends in the town of Nagpur, in Maharashtra state. "I have put Nagpur on the world map. 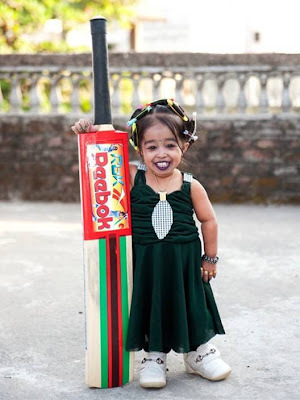 Now everyone will know where it is," said Jyoti, who says she dreams of one day becoming a Bollywood film star as well as pursuing a university degree after she finishes high school this year. 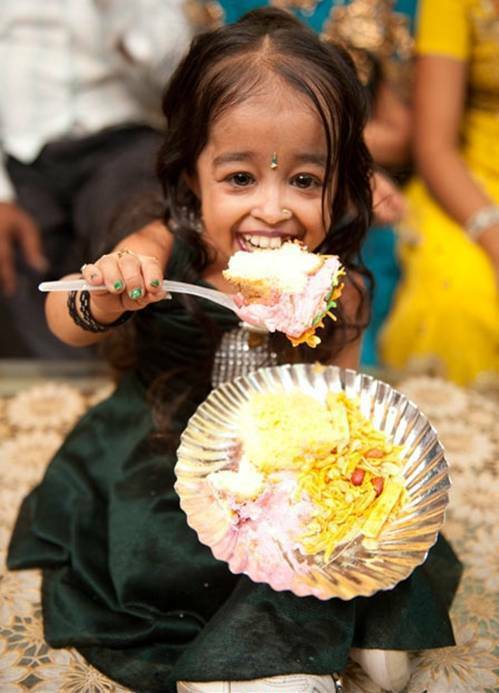 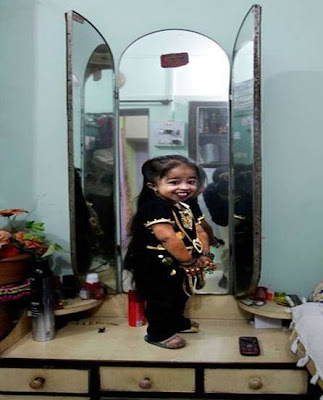 Jyoti, who at just 11lbs (5 kg) is half the weight of her two-a-half-year-old neighbour, has a form of dwarfism called achondroplasia meaning she stopped growing shortly after her first birthday. Jyoti’s parents fear for her future. 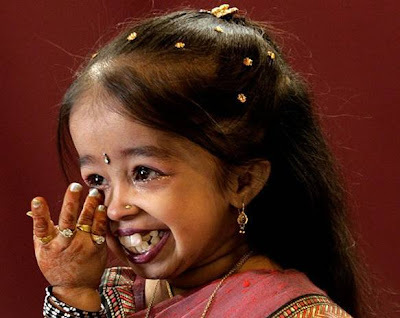 Growth problems have left her bones so brittle they are in danger of breaking in a simple fall. She is likely to need care for the rest of her life and older sister Archana, 26, admits she is likely to have to care for Jyoti as her parents get older. 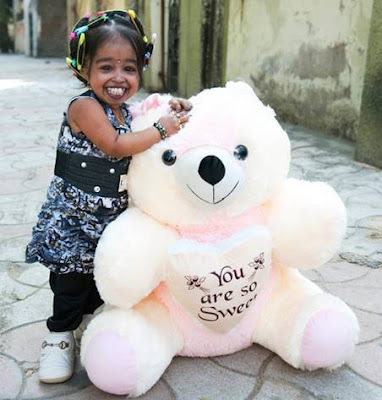 Due to her size, Jyoti has to have clothes and jewellery made for her. She sleeps in a tiny bed and uses special plates and cutlery to eat, as normal-sized utensils are too big. 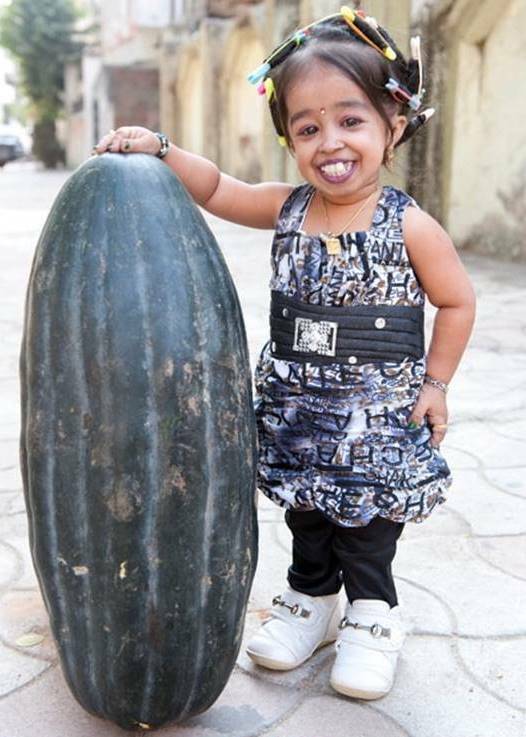 She’s so small she even fits perfectly inside the basket on her sister’s bicycle when she needs to be taken around town. 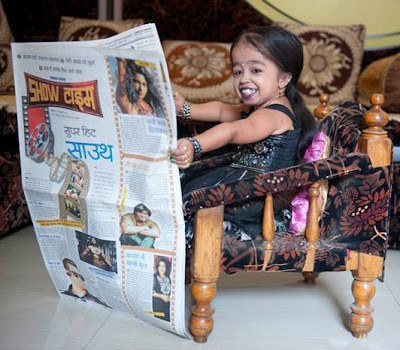 With dreams of stardom, Jyoti has already featured in a music video for Indian Bhangra-rap star Mika Singh, TV shows across the world and an hour-long National Geographic documentary on her life. Bollywood has also come calling, with two films lined up for the budding actress next year.